We’re excited to reveal three new Tier 6 Science Vessels, one for each faction! The first is an enhanced version of the Advanced Research Vessel, called the Sutherland Class Advanced Research Vessel [T6]. This starship is available for Starfleet players at Vice Admiral Rank. The second starship is the Naj’Sov Research Vessel [T6], a brand new Klingon Science Vessel. This starship is available at Lieutenant General rank for Klingon players. Lastly, is the Laeosa Research Warbird [T6]. This formidable Romulan Science Vessel is also brand new. Each of these science vessels will have a Fleet variant made available upon release. As usual, these powerful Tier 6 starships will feature a new Console and Starship Trait. All three of these Tier 6 starships come equipped with a Tachyon Particle Field Emitter Universal Console. Activating this console's ability will cause your starship to emit a densely packed field of tachyons around your ship in a large radius. These particles interact with the shields of foes and allies differently. Foes within this field's radius will suffer dramatic shield damage and a lingering shield hardness debuff. Allies within this field will receive shield regeneration and a shield hardness buff. Upon expiration of this field, a final tachyon particle pulse will be emitted that will deal a more powerful version of the effects listed above. This console may be equipped on any Starfleet Advanced Research Vessel, any Naj’sov Research Vessel variant or any Laeosa Research Warbird variant. Each of these starships can unlock the Tachyon Dispersal Starship Trait by achieving level 5 in their Starship Mastery. While this trait is slotted, Tachyon Beam will significantly reduce the target's shield hardness while channeled. In addition, if Tachyon Beam reaches its full duration it will release a large burst of Tachyon energy that will inflict shield damage over time and reduce the shield hardness of affected targets within its radius. Each starship features its own unique costume. The Sutherland Class has access to additional costumes as well, more on this below. Purchasing the Advanced Research Vessel [T6] will allow usage of the Sutherland, Magellan and Nebula costumes. Additionally it will unlock access to the Phoenix Mission Pod and Stanchions. 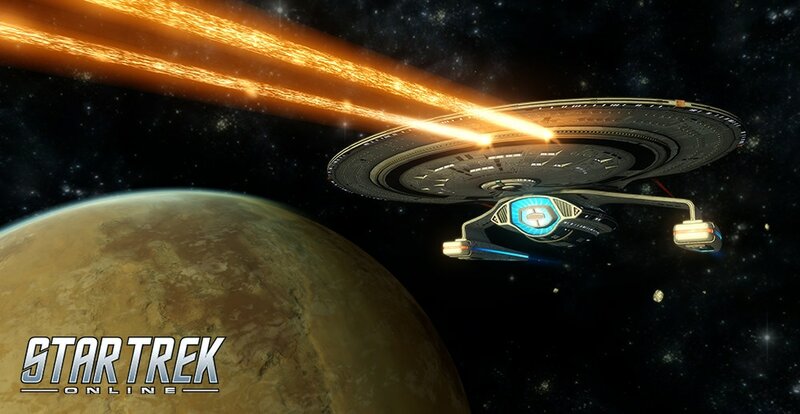 Purchasing the Venture Class Exploration Cruiser will also unlock the Venture costume for the Sutherland. These starships are available in the C-store individually, or they can be found packaged together in the T6 Cross Faction Science Bundle.